Looking for a place to have high-level executive meetings that offer important services such as high speed internet and the professional environment befitting meetings of such importance? 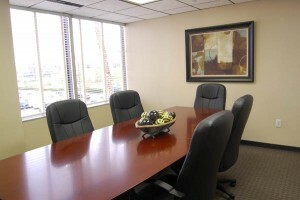 Southwest Suites of Orlando has the Executive Conference Rooms perfectly designed to fit these needs. Regardless of your business’s place within your industry, having meetings with top executives and potential clients should only take place where your company’s underlying message of successful service is buttressed by the place the meeting is held. The executive conference rooms at Southwest Suites of Orlando are designed with your company in mind. The tables are beautifully-finished heavy wood, the chairs are comfortable plush leather, and the room is equipped with technology such as high speed internet to facilitate all the technological needs of an executive conference. Executive conference rooms are not just tables, chairs and technology. They also must convey the right type of atmosphere. What is notable about Southwest Suites of Orlando is the atmosphere begins when you walk in the building. Adorned with beautiful but tasteful art and the classic furnishings of any office building, Southwest Suites of Orlando’s executive conference rooms provide a comfortable, but elevated atmosphere, giving your meeting the level of gravitas it naturally demands. Executive Conference Rooms are only available to tenants in the building and can be reserved on out TENANT RESOURCES page. Contact us to learn more today!